Oil a 9 x 13 baking pan (I actually just used a good bit of Pam) and sprinkle on powdered sugar to cover and coat. Set aside. In the bowl of your electric mixer (a whisk attachment is best), pour 1/2 cup cold Bailey's and 3 1/2 packs of gelatin. I gently mixed with a spoon once, then let sit while you make the sugar mixture. In a medium pot combine sugar, remaining Bailey's, syrup and salt. Heat over low heat and whisk until sugar is dissolved, about 3-5 minutes. Turn heat up to medium and let sugar come to a boil. It will bubbly up so keep yours eye on it so it does not overflow. Let it boil for 8-12 minutes, until it reaches 240 degrees F (measure with a candy thermometer). Once mixture is at 240 degrees F, turn off heat and gently pour it in the mixer over the gelatin with the mixer on low speed. Once all of the sugar has been added, turn the mixer to high and beat for for 6-8 minutes. It should grow in size and be white and fluffy. About 3-4 minutes in, add the egg whites to a separate bowl and beat until stiff peaks form. I used a hand mixer to do this. If you don’t have a hand mixer, I assume you have to remove the whisk attachment, clean it (it will be a sticky mess), add a new bowl to the mixer, beat egg whites. Once stiff peaks are formed, add egg whites and vanilla extract to the sugar/gelatin mixture and beat until just combined. Pour marshmallow mix into the 9 x 13 pan. It will impossibly sticky so be careful, and you will not be able to get it all out of the bowl. Get as much as you can, then spray a spatula with non-stick spray and smooth. Dust powdered sugar on top and let sit to firm up for 3-5 hours. Once firm, turn the pan upside down on a cutting board to release marshmallow rectangle. Cut them into pieces of whatever size you like. Melt milk and dark chocolate chips separately (I melt in 30 second increments in the microwave and stir) in two bowls. Crush hard sourdough pretzels. 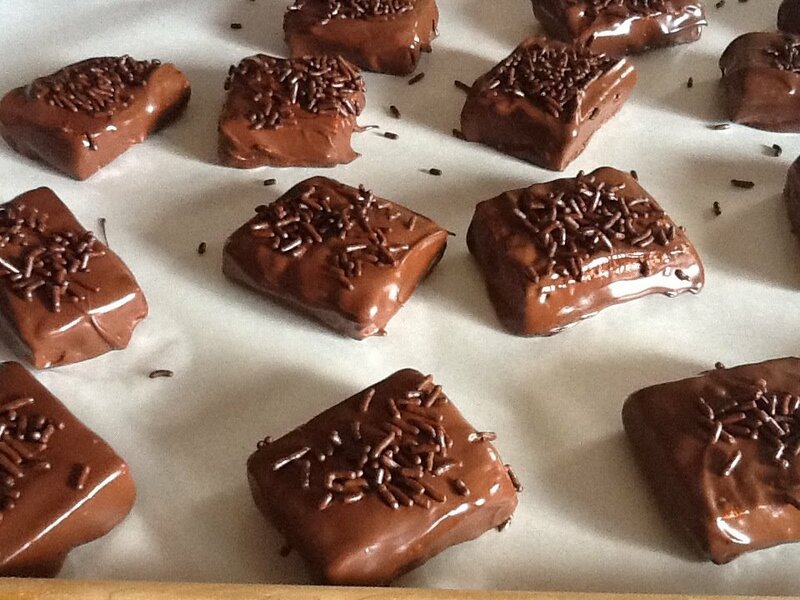 Using a fork, toothpick or fondue pick, coat marshmallows in chocolate then sprinkle with or roll in pretzel crumbs. You can also drizzle with salted caramel. Let sit at room temperature until chocolate hardens. Marshmallows can be stored in an airtight container for 1-2 weeks! SOURCE: I got this idea from Laudina who got it from - Idea from an ad seen in Food and Wine, then a quick google search led me here; marshmallow recipe from smittenkitchen, subbing baily's for water.